What Reserve Capacity Should My RV's House Batteries Have? My Motorhome came with 4 industry standard 6 volt deep cycle house batteries. They are 5 years old and one or two of them are swollen and creating a lot of external acid. They charge fine. In the process of looking for the most economical battery and talking to different people, I am now looking at a 6 volt golf cart battery. The only thing I am not sure of is the battery RESERVE. The original had a reserve = 445 and the Golf cart battery has a reserve of 100. What is Reserve and what do you think about this substitute? I believe you are talking about Reserve Capacity of the battery. The number stands for how many minutes the battery will provide useful voltage to your RV's 12 volt DC accessories under a constant 25 amp load (discharge). The higher the number the better the battery is at providing useable voltage to your 12 volt lights, water pump, furnace blower motor, etc. for a longer period of time under load. So based on the numbers you have given me you will be losing 345 minutes of useable battery time when you switch the batteries. Now you have a choice to make. If you do not do extensive Boondocking (camping away from electric, etc.) then you should be alright using the less expensive batteries. 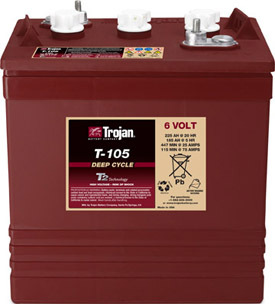 But if you plan on doing a lot of boondocking you may be better off buying 6 volt deep cycle batteries with a higher reserve capacity. That being said you will be fine with the new batteries as long as you understand that you may have to run your generator more frequently to charge the lower Reserve Capacity batteries. It would also be helpful if your Motorhome was equipped with a Solar Charging System . Comments for What Reserve Capacity Should My RV's House Batteries Have? I believe golf cart battery Reserve Capacity is measured differently than deep cycle batteries normally found in RVs. Golf cart battery Reserve Capacity is measured with a 75 amp load instead of the 25 amp load mentioned in the article. When measured with a 25 amp load, a 100 minute golf cart battery will carry that load in the neighborhood of 400 minutes. Bill - check out www.trojan.com - they have higher capacity 6 volt batteries available with the same size case as your batteries in the coach - there is also a lot of technical informataion on this site and a aguide to selecting batteries.